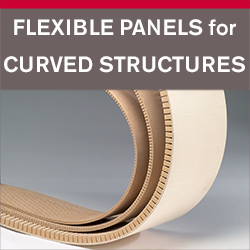 One skin of Neatform either side of 6mm / 1/4” or 9mm / 3/8” bending plywood – to materials create solid free standing curved shapes. Used on more structural applications including: cabinet doors, drawer fronts and decorative walls, kick boards. This method is particularly good when screw and hinge holding characteristics are required. 1. To create a free standing curved surface with Neatform Bendy MDF and bending plywood, first bend the two pieces of Neatform and one piece of bending plywood to the approximate shape, and roughly cut to size. Please note that the grooved faces on the Neatform face inwards. 2. Apply a good even coating of PVA glue to the mating surfaces of all three sheets, while noting that it is not necessary for the Neatform grooves to be filled with glue. A paint roller is an ideal tool for this job. 3. Sandwich the bending plywood between the two sheets of glued Neatform and bend to the finished shape. 4. While the glue is still wet, clamp into shape, applying moderate pressure, normal to both, faces to ensure a good bond, and leave to set. Follow the adhesive manufacturer’s guidance on curing times. 5. When released, Neatform will retain its shape, ready for trimming and finishing.